Hydrogen powered vehicles have been around awhile. The challenge for driving cars powered by hydrogen is storage. Storage and availability of refueling stations. How do you store enough hydrogen to drive a car 350 miles? Where can you refuel your hydrogen powered car? I blogged about a new car by Honda that can do these long range drives. Now Honda has also started using hydrogen to power short range equipment too. In their own factory! Briggs Equipment installed a hydrogen powered truck system at Honda’s Swindon manufacturing facility. 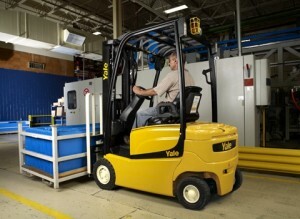 The fork truck built by Yale has been converted to rely entirely on renewable energy sources. The new system generates hydrogen from solar power via electrolysis. Now all the energy to drive the fork truck is clean and renewable with zero emissions. The Scottish Hydrogen and Fuel Cell Association has a nice article about this. The World Industrial Reporter also has a nice article about the new hydrogen powered fork truck at Honda’s Swindon factory. Richard Close, Briggs Equipment CEO explained how the consortium has worked hard with Honda to produce commercial volumes of truly ‘green’ hydrogen to power the converted Yale trucks in operation at the Swindon plant.